After far-left NGO, Hamas regime demand return of dead terrorists' bodies, IDF seizes terrorists' remains from terror tunnel. Israeli forces operating in a terror tunnel along the border with Gaza have located and retrieved the bodies of 5 of the 12 Islamist terrorists killed when the IDF demolished the tunnel in a controlled explosion last week. 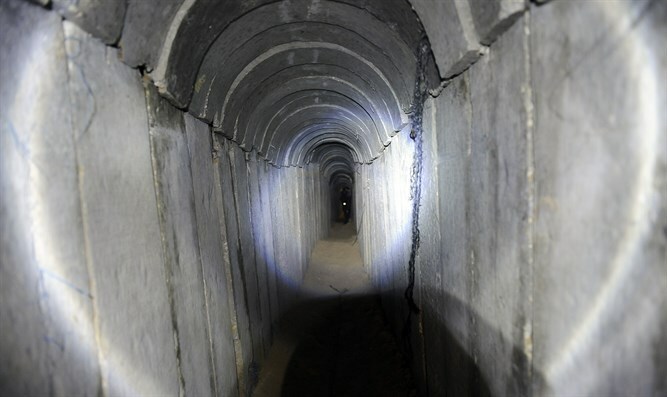 The tunnel, part of a network which extended from the city of Khan Yunis in the southern Gaza Strip into Israeli territory, was destroyed as part of the IDF’s efforts to prevent terrorists from maintaining underground routes the Gaza security fence. Twelve Hamas and Islamic Jihad terrorists operating in the tunnel at the time of the explosion were killed, with several others injured. Despite demands by Hamas and Islamic Jihad that they be permitted to enter the tunnel to retrieve the bodies of their fellow terrorists, Israel refused, saying it would not permit any entry into the tunnel system, which extended into Israeli territory. "Following the request of the International Committee of the Red Cross to reveal the location of the terrorists missing under the tunnel, which was handled by the IDF this week, the Coordinator of Government Activities in the Territories, Major General Yoav Mordechai, spoke to the head of the delegation of the International Committee of the Red Cross," the COGAT announcement said. It also noted that Maj. Gen. Mordechai "made it clear that Israel would not allow search operations in the security barrier area in the Gaza Strip without progress on the issue of Israeli POWs and MIAs." Petitioners from the far-left Israeli-Arab NGO Adalah turned to the Supreme Court, calling on the court to force the government to permit Hamas to retrieve the bodies of the dead terrorists. On Sunday, however, it was revealed that IDF forces operating in the tunnel following the demolition had located the remains of five of the terrorists. The terrorists’ bodies have been recovered and are currently being held by Israel. "We are indeed in possession of those bodies of five terrorists," IDF spokesman Jonathan Conricus told AFP. "All were killed or died inside Israeli territory, not in the Gaza Strip." The Hamas terror group has held the bodies of two slain IDF soldiers, Hadar Goldin and Oron Shaul, in captivity since 2014, demanding the release of large numbers of jailed Arab terrorists as a goodwill gesture before negotiations for the soldiers’ release even begin. Three Israeli citizens are also believed to be held by Hamas.